The hen harrier could soon become extinct in Ireland if nothing is done to protect and restore upland landscapes. The hen harrier is one of Ireland's most iconic upland bird species. Yet this slim, long-tailed hawk has been driven almost to extinction by sustained habitat loss and mistreatment. It is in grave danger of becoming extinct in Ireland in the next 30 years if nothing is done to protect and restore upland landscapes. To save this precious bird of prey, the Golden Eagle Trust is spearheading an urgent conservation initiative on behalf of the National Parks and Wildlife Service, and GIS is playing a critical role in conservation measures. The Golden Eagle Trust, a nonprofit dedicated to safeguarding and restoring Ireland's native birds and their habitats, was appointed in June 2013 to help identify the pressures and threats on hen harriers and gain a better understanding of why the population is declining. The organization is carrying out its research in six special protection areas (SPAs) that have been designated hen harrier breeding zones. From 2005 to 2010, these SPAs—which cover more than 167,000 hectares across the country—saw a severe 18 percent decrease in the number of hen harrier territorial pairs (mates that defend their territories against similar birds and potential predators). To fulfill its mission, the Golden Eagle Trust urgently needed to establish accurate knowledge of hen harriers' habitats, as well as various land uses within their breeding areas. To do this, the trust acquired ArcGIS for Desktop from Esri Ireland and began using it to create a comprehensive, species-specific habitat and land-cover map for all six SPAs. 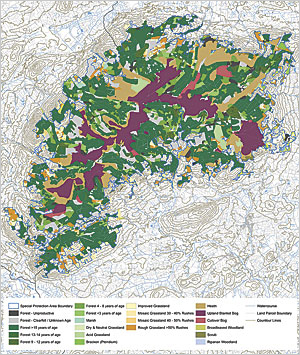 The organization amalgamated existing data and aerial photography from a range of partners, including Ordnance Survey Ireland, the National Parks and Wildlife Service, the Forest Service, natural resource management company Coillte, Irish agriculture and food development authority Teagasc, the All-Island Research Observatory, and Esri Ireland. It then imported GPS data from three previous national hen harrier breeding surveys that showed the locations of territorial pairs to identify the birds' important areas for nesting and foraging. Thus, the Golden Eagle Trust created a single source of authoritative habitat data. The organization then used the powerful analytical capabilities of ArcGIS to analyze land cover, which yielded insights into how suitable (or unsuitable) different habitats within the SPAs are for hen harriers. This resulted in better comprehension of the challenges these birds face. ArcGIS helped the Golden Eagle Trust see that 80 percent of the forest in Ireland's special protection areas is unsuitable habitat for hen harriers. ArcGIS has given the Golden Eagle Trust unequivocal evidence as to why the hen harrier is struggling to survive in Ireland. It shows, for instance, that just 20.2 percent of the SPAs are actually the birds' favored open heath and grassland areas, while 80 percent of the forest in the network is unsuitable for these hawks due to dense canopies and high numbers of predators. "ArcGIS confirmed that the increasing extent of mature forest in upland breeding areas is a significant driver of decline in the hen harrier population in Ireland," said lead project ecologist Ryan Wilson-Parr. The Golden Eagle Trust now uses the insights garnered using ArcGIS to assist the Irish government in implementing targeted, cost-effective approaches to land management for the benefit of the hen harrier. "Analysis in ArcGIS can provide optimum conservation scenarios for the hen harrier in SPAs, identifying the most demographically and economically advantageous options for forest removal whilst providing the greatest benefit in terms of habitat restoration for the hen harrier," said Wilson-Parr. "ArcGIS also provides insight into how landscapes will change over time and, crucially, how the hen harrier population will likely respond in the long term." The trust also depends on ArcGIS to help it consider the environmental impacts of changing land-use patterns for agricultural land, as well as renewable energy development in SPAs. 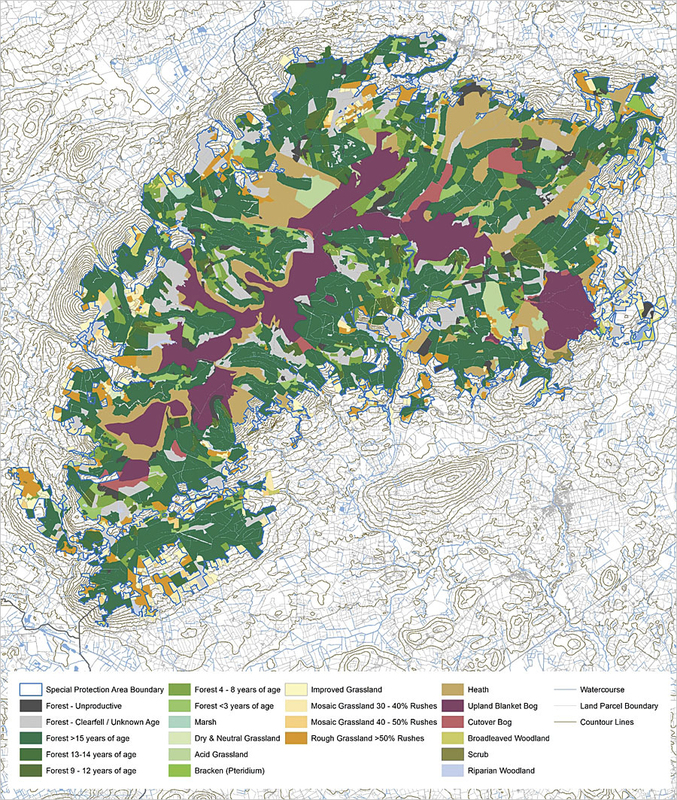 "The GIS habitat map will allow a really accurate and evidence-based assessment of new development schemes," said Wilson-Parr. "It will help us to understand how new projects, in combination with other existing developments and land use, can impact the hen harrier population. It will also show how we can promote sustainable forestry and expand renewables while protecting the hen harrier and the habitats on which it depends." Wilson-Parr is realistic about future obstacles, though. "Hard decisions will need to be made about how to balance the needs of local landowners, rural communities, and developers while meeting the government's legal obligations to protect the hen harrier," he said. "Having this GIS-based habitat map gives us the evidence government agencies need to justify the substantial conservation effort and important land-use changes required to save this species while being sensitive to other social and economic pressures." For the Golden Eagle Trust, GIS has been the foundation of evidence-based decision making and effective land management during this project. "ArcGIS holds the key to helping us halt the decline in hen harriers," said Wilson-Parr. "It gives us hope that we can safeguard this iconic bird for future generations."